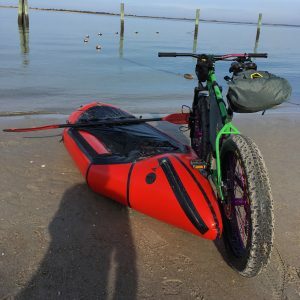 With no snow in the forecast for the mountains of Western North Carolina and a convenient break in the cold wet temps out on the outer banks got us thinking about a bikepacking trip. 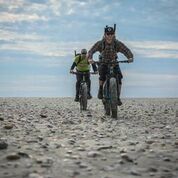 If you have no snow in the mountains to ride on, sand is a perfect second best for a REEB Donkadonk, and the beach seemed like just the right respite from the cold of the mountains. 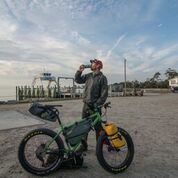 I set out with Chris Reichel of Industry Nine and Andrew Slowey of Cane Creek Cycling Compnents to ride a remote section of the uninhabited islands of North Carolina’s Outer Banks. Much of the outer banks is national seashore with little services and even less in the dead of winter when 4×4 driving beach goers aren’t around. 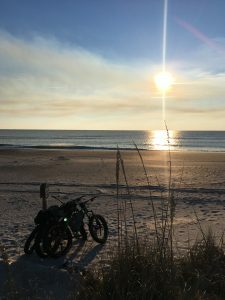 We wanted to ride as much of the Cape Lookout National Seashore section as we could or was deemed safe to do. This time of year, only one ferry service was running folks out to the seashore and they weren’t going were we were hoping to start. After a little prying I found a gal who was willing to drop us north of the Ophelia Inlet on North Core Island. Intel on the area at large was tough to get and dependable intel even tougher. As far as I coul gather we were going to need to paddle across 2 breaks or inlets separating North and South Core Islands and South Core from Shackleford Banks island. When packable space is at a premium and dependability is paramount, Alpacka Raft is the only packraft option. They made sure that we had the right boats for the job. It’s essential when you are ferrying your bike and all your personal shite across an ocean inlet that you get it right. They do! The riding itself was pretty straight forward, very different from the constant contours of the mountains. We plugged along at a modest party pace most of the time. Much like an RV, we plodded along with no real hurry to get anywhere. 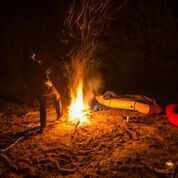 We could camp anywhere on the islands that we wanted and our fat bikes carried everything, even a surprising amount of barrel aged Tenfidy to make it all worthwhile. We made our way north to south along the South Core Island all the way down to the cape where the lighthouse is. There is an old abandoned village down there which is pretty surreal. The cape creates a bite which makes crossing the bay over to Shackleford banks a pretty easy paddle. 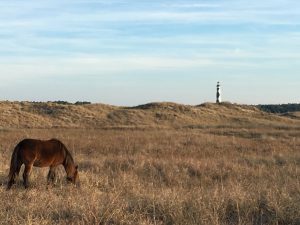 On Shackleford Banks wild ponies marooned there hundreds of years ago from Spanish ships still roam free. 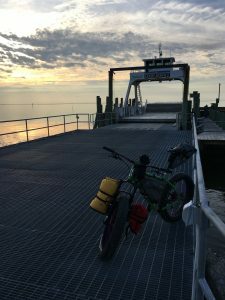 Riding on this island was no tallowed so we stashed the bikes and paddled over to camp on the island. Sure enough after just a few hundred feet inland herds of wild ponies can be seen grazing. While not a high mile trip it was pretty cool and we definitely made it fun. 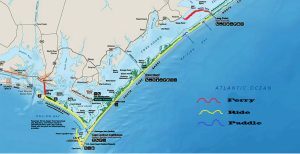 I think that next trip I will try and link more of the Outer Banks perhaps trying to ride the entire length. If done in a little warmer weather an inflatable paddle board and fishing rod will be a must. With no real timeline or reserved campsite to make, you could stop fish for your meals and even sneak in a few surf missions.